WEST LAFAYETTE, Ind. 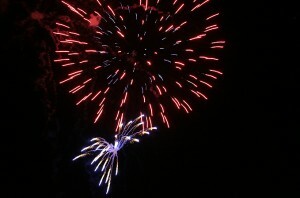 — As the Fourth of July approaches, parents should remember that fireworks could cause permanent hearing loss in children, says a Purdue expert. Having children wear earplugs during a fireworks show can help reduce the risk of hearing loss, and dampening the sound could make a fireworks show less frightening to children. “One large acoustic event – when it is very loud at one time – can cause hearing loss,” says Jennifer Simpson, clinical assistant professor in the Department of Speech, Language and Hearing Sciences and director of the Audiology Clinic. Having children wear earplugs during a fireworks show can help reduce the risk of hearing loss, Simpson says. She also added that dampening the sound could make a fireworks show less frightening to children. Noise-induced hearing loss also can be caused by extended noise exposure and is typically permanent. Concerts, power tools, guns and fireworks are a few of the noises that can cause hearing loss. Everyone is susceptible to noise-induced hearing loss, but children seem to be around noise now more so than adults, Simpson says. Another common way children can lose hearing is due to ear infections. However, this hearing loss is usually temporary, she says. According to the National Institute on Deafness and Other Communication Disorders, ear infections are the most common illnesses in babies and young children, with three out of four children experiencing an ear infection by the time they are 3 years old. If a child does have an ear infection, it’s important to take them to your primary care provider for treatment. Once the infection is gone and there is no more fluid in the ear, the child’s hearing should return to normal, Simpson says.